G. E. Hein (2014) "Organizational Change within Participating Institutions Related to the Medborgerskab Project" in Sasja Brovall Villumsen, Dorthe Juul Rugaard og Lise Sattrup ,Rum for Medborgerskab Copenhagen: Statens Museum for Kunst, p. 16-31. This chapter (and the whole book) are available here. An introductory chapter written in 2009 for Boston Stories: The Children's Museum as a Model for NonprofitLeadership, a collaborative effort led by former Boston Children's Museum director Michael Spock, that includes conventional text, photographs, and illustrations; as well as companion media and a fully searchable and downloadable digital archive. Publication is expected soon. G. E. Hein, “Museum Education,” in S. MacDonald, editor, A Companion to Museum Studies, Oxford: Blackwell Publishing, 2006. Chapter 20. M. Black and G.E. Hein “You're Taking Us Where? Reaction and Response to a Guided Art Museum Field Trip,” in M. Xanthoudaki, L. Tickle & V. Sekules (eds.) Researching Visual Arts Education in Museums and Galleries, Dordrecht: Kluwer Publishers, 2003. G. E. Hein and S. Lee, "Assessment of Science Inquiry," in Inquiry: Thoughts, Views, and Strategies for the K-5 Classroom, Washington DC: National Science Foundation, 1999. 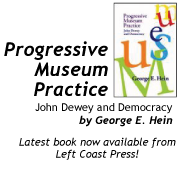 G. E. Hein, "Evaluating Teaching and Learning in Museums," in Eilean Hooper-Greenhill, editor, Museums, Media, Message, London: Routledge, 1995. G. E. Hein, "Active Assessment for Active Science," in V. Perrone, editor, Expanding Student Assessment, Alexandria, VA: Association for Supervision and Curriculum Development, 1991. B. S. Engel and G. E. Hein, "Qualitative Evaluation of Cultural Institution/School Education Programs," in S. N. Lehman and K. Igoe, editors, Museum School Partnerships: Plans and Programs, Washington, DC: Center for Museum Education, 1981. G. E. Hein, "Standardized Testing, Reform is not Enough," in Testing and Evaluation: New Views, Association for Childhood Education International, Washington, 1975. G. E. Hein, "Let's Not Teach the History of Chemistry," Teaching the History of Chemistry, A Symposium, G. Kaufman, editor, Academiac Kaido, Budapest, 1971, p. 39. G. E. Hein, "Children's Science is Another Culture," Technology Review, December 1968, p. 61. Reprinted in The ESS Reader, Education Development Center, Inc., Newton, 1970. S. Kumar and G. E. Hein, "A Rapid Kinetic Method for the Differentiation of Native, Modified and Inactive Enzymes," in Structure and Reactions of DFP -Sensitive Enzymes, E. Heilbronn, editor, Forsvarets Forskingsanstalt, Stockholm, 1967, p. 89. G. E. Hein, "Kekule and the Architecture of Molecules," in Kekule Centennial, O. T. Benfey, editor, American Chemical Society, 1966, p. 1. G. E. Hein, "The Liebig-Pasteur Controversy," J. Chem. Ed., 38, 617 (1961), reprinted in Selected Readings in the History of Chemistry, A. J. Ihde and W. F. Kieffer, editors, American Chemical Society, Easton, PA, 1965.